Please keep in mind that some email passwords could be stored in browsers. This depends on whether the user was using the email client or was reading emails in a Web browser. 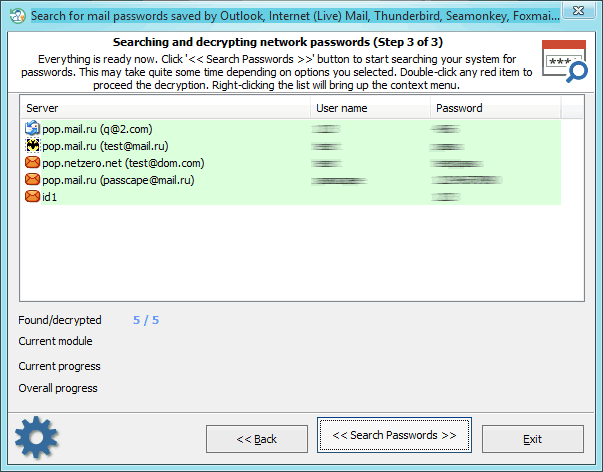 Passwords from Outlook Express, TheBat!, Incredimail, Eudora, and some versions of MS Office Outlook can be decrypted almost instantly. Decrypting other data requires the account password. Simply double-click on the record highlighted in red. That activates the second step of analyzing the found data. If the entered user password matches the other records, they will be decoded automatically.